There’s 73 days until the first scheduled race of the 2018 Sperry Charleston Race Week, but the $100 early registration discount expires at the end of January. That’s fifty Thomas Jefferson’s as a reward for teams to stop procrastinating and sign up for one of the better regattas on the East Coast. 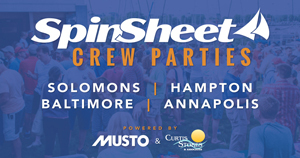 Without Key West Race Week in the mix anymore, this will be the first big event of 2018 for many sailors. 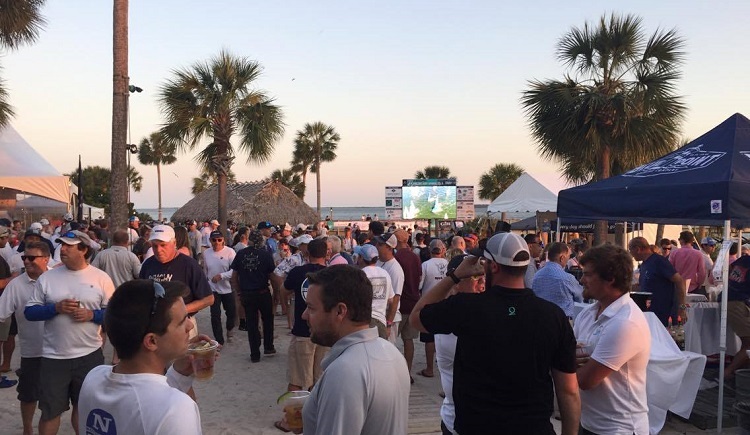 Last year there were 211 boats in Charleston, making it one of the largest events on the east coast. So what motivates 200+ boats to pack it up and head to the Palmetto state in April? The party delivers. Staged as a beach party, there are beautiful views of Charleston Harbor and you can catch sunset over the city each night. The dinners that are served up rarely disappoint and there are multiple bars serving up the Goslings and beer without (usually) too much of a wait. Even when the lines do get a little longer, attendees commonly embrace the whole concept of good Southern manners and there tends a good band playing on the event stage, so it’s never all that bad. 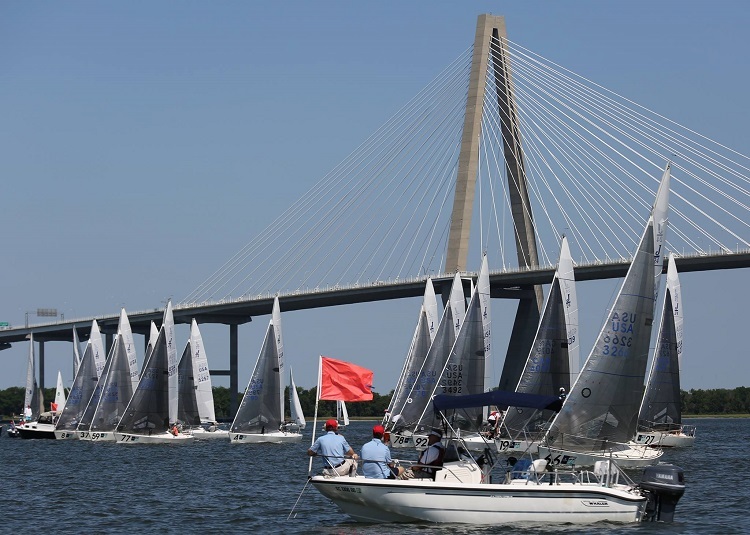 If you’re docking out from the Charleston Harbor Hotel & Marina, you’ll be greeted each race day by smiling volunteers, bagels, and coffee as you walk down to your boat. Chances are pretty good that you’ll go the entire regatta without running into someone that isn’t nice or helpful. The whole “people are nicer in the South” thing isn’t a myth. Don’t read anything into the fact that the racing is listed third here. The commute to and from the inshore courses is usually just 15-20 minutes, which leads to a civilized dock call. The racing itself tends to be quick and exciting due to the constraints of the geography. It’s not a particularly spacious area to stuff four racing circles, so the courses can sometimes be on the shorter side depending on the direction of the wind. The Wando, Ashley, and Cooper Rivers all flow into Charleston Harbor, so the current is no joke -- get it right and you’ll be rewarded, but the punishment for getting it wrong is the racing equivalent of certain death. There are shifts everywhere on which to make gains (and, you know, losses) and with course distances on the shorter side of ruler, really good crew work is always necessity. The joy of getting it all right is pretty special though. The offshore course for the bigger boats really has an ocean racing feeling because, well, it’s on the Atlantic Ocean. We’ve seen everything including flat conditions, proper ocean swell, and confused washing machine seas -- it challenges crews to be well-rounded and it isn’t all about straight line speed. Admittedly, the commute to and from the course can be on the longer side of things, but it’s more scenic and relaxed than your commute to work, so try to keep everything in perspective, would ya? Charleston is a pretty special city. It’s been voted the #1 city in the US/Canada by Travel & Leisure for five straight years and it’s not hard to understand why when you walk around downtown. There’s amazing food everywhere -- if you’re ever hungry or not happily loosening your belt in Charleston, you’re not doing the city right. There’s history, architectural beauty, culture, and happy people everywhere. Also, on average, it’s twelve degrees warmer in Charleston than most of the Chesapeake in April. Tell us that doesn’t sound good right about now? You know what? No. We’re not doing another point. You can’t possibly need more justification to go to a beautiful city like Charleston, SC to race a sailboat for three days against great competition in a unique environment. Beat the deadline and register for CRW before January 31st to save that $100 and we’ll see you there!